TRUE-STORE EU – Brain-Pads for European Competitors! Brain-Pad welcomes TRUE-STORE.EU – Top online shopping place for the .EU ! 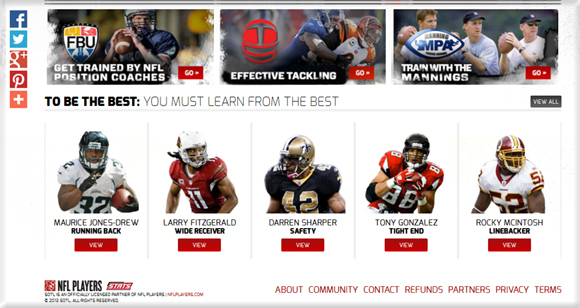 Excellent Video Instruction with on-line, on-demand access hosted by NFL Pros. Also available on hard copy Disc as a 2-DVD Set. Disc purchase also grants on-line, on-demand access. BRAIN-PAD HIGHLY RECOMMENDS THIS EXCELLENT TUTORIAL FOR ALL THAT TEACH, COACH, AND TAKE TO THE FIELD. THERE IS ALWAYS SOMETHING TO BE LEARNED FROM THE BEST of the BEST. Boil water. Submerge guard as the instructions state(a 2 stage-boiling process) . . .
Give your ‘star athlete’ a high-five and he is 1 step closer to lacing up his skates! It is really that easy to “Reduce jaw impact energy from entering his jaw-joints & the base of his skull!”. Brain-Pad compliments even the best helmets available! 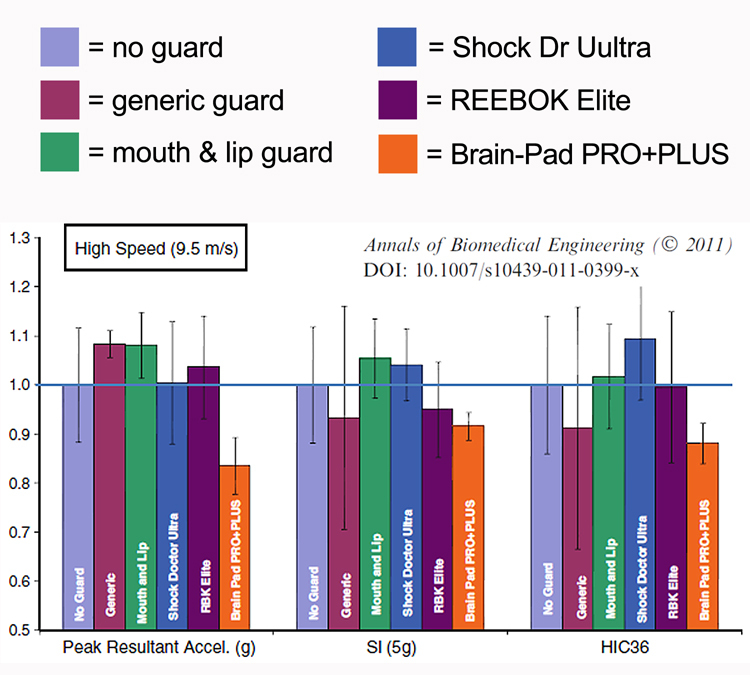 This is the Low Speed Impact Graph – Peak acceleration references the jaw’s velocity prior to slamming into the head-form’s TMJ Sockets: How about a High Speed Impact ? 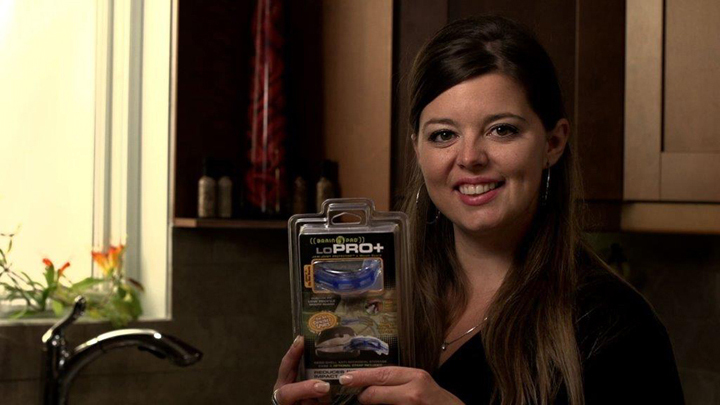 Did the Brain-Pad PRO+, win the day again ? Looks like we have a winner! . . . If winning means keeping malicious impact energy away from your jaw-joints/TMJ sockets and outside of the base of your skull . . .
Brain-Pad now has its newest design available this winter season – The 3XS Jaw-Joint Protector in black and translucent blue or white and translucent black. The 3XS is based from the PRO+ design and adds a 3rd impact absorbing thermoplastic in the channel arms which further reduces impacts. So get a mouth guard and take your chances. Or get a Brain-Pad Jaw-Joint Protector and reduce your chances of jaw impact injury! Brain-Pad Technology is effective – Stephen D. Smith, D.M.D., Paoli, Pa. 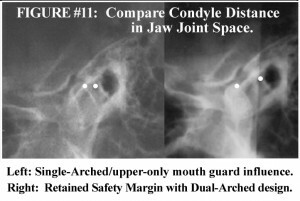 I support the dual arch technology you have developed for the purpose of jaw impact reduction. Certainly cushioning the condyle and teeth with a 3-4 mm interocclusal elastomeric material helps reduce impact upward against the glenoid fossa and skull. 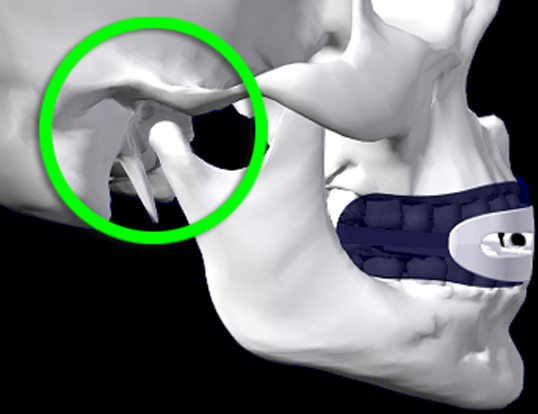 The temporal bone is thinnest at the top of the glenoid fossa/housing of the TMJ, with as little as 1/8″ to 1/16″ thickness, and susceptible to injury, including perforation. The helmeted sports accelerate a whiplash fulcrum effect on the temporomandibular joint through chinstrap force. 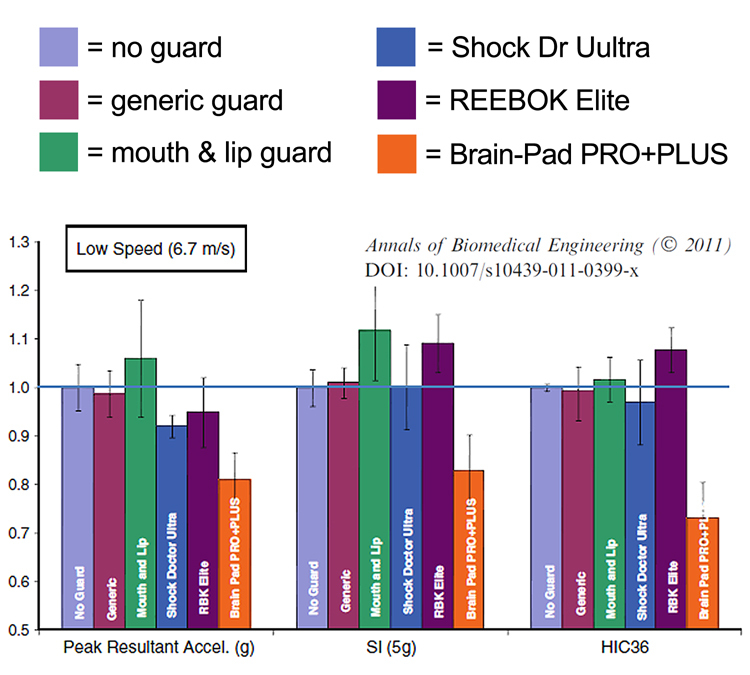 Cushioning the mandible down and forward is essential in mouthguard design related to impact energy mittigation. This also occurs with martial arts impact sports where a direct blow to the jaw can occur. The design of airway opening for breathing, and protection of all the teeth are other advantages of your design. Stephen D. Smith, D.M.D., Paoli, Pa. 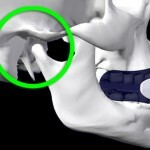 Wrestlers ‘get’ the Jaw-Joint Protection Edge ! In wrestling, the lower jaw is left wide open for impact damage ! 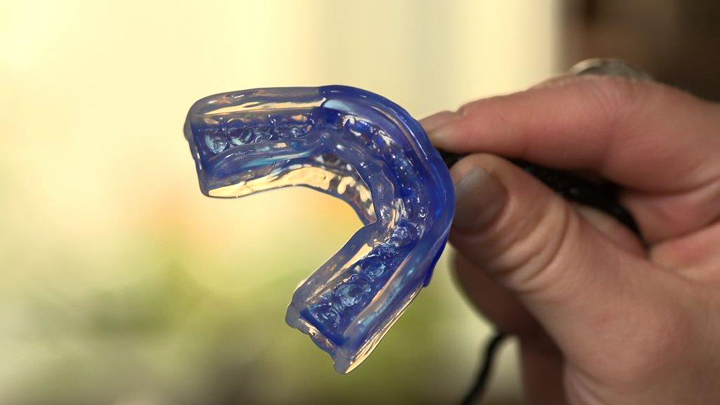 ” I have tried many different upper mouth guards, but I could not breathe at all. mouth injury, cut lip, or chipped tooth – I won’t Wrestle without it ! “. No More Bloody, Cut Lips ! Designed to protect all braces ! from your opponent or the mat are reduced ! ALSO GREAT FOR STRENGTH TRAINING ! The helmet-to-helmet shot knocked Tony Dorsett out cold in the second quarter of a 1984 Cowboys-Eagles game, the hardest hit he ever took during his Hall of Fame NFL career. “It was like a freight train hitting a Volkswagen”, Dorsett says now. I just received a penalty for not having a mouth guard. Why do I need to wear one? Question: I just received a penalty for not having a mouth guard. Why do I need to wear one? Answer: I think you know part of the answer to this one already. While the obvious answer to using a mouth guard is that it protects your teeth from being chipped or knocked out, a mouth guard is also a very important safety device to prevent injuries. The main purpose of a mouth guard is clear. It is there to protect your teeth from possible direct blows where they can either be chipped, significantly fractured, or knocked out. While serving a purpose in this regard, they also help to prevent some of the bad lip and cheek lacerations which can happen when a tooth is broken. The other purpose of a mouth guard is to act as a shock absorber in your mouth. It serves as a spacer between the top and bottom row of your teeth and absorbs shock should you receive a blow to your jaw. You can imagine that if you have a significant blow to your chin that this force is going to go from your chin up through your jaw bone, into your teeth. In this regard, a mouth guard helps to decrease jaw bone (mandible) fractures. I hope this answers your question and that you choose to wear a mouth guard in all ice hockey related activities in the future. Wearing a mouth guard, and the rules which enforce it, are sort of like the rules for having seatbelts in cars. The mouth guard serves as a seatbelt to protect your teeth & jaw bone. Copyright © 2012 Let’s Play Hockey. All Rights Reserved. Brain Pad Protective Solutions intra-oral Jaw Joint Protectors™ create a much needed new category in protective equipment that addresses lower jaw impact injuries. 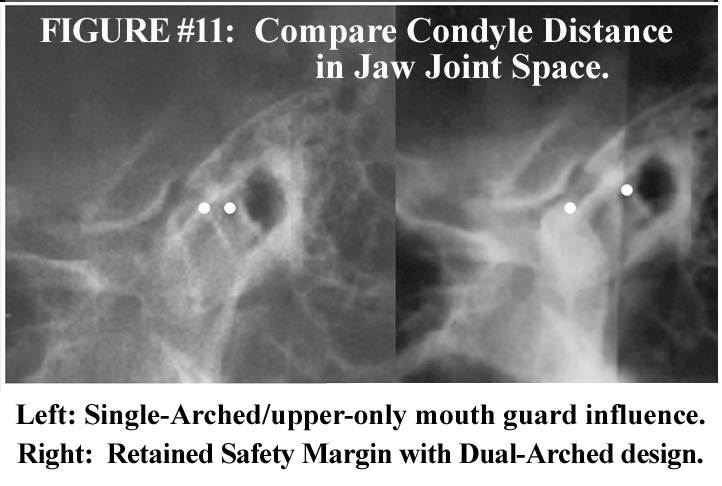 The Jaw Joint Protector™ is a solution that will greatly reduce jaw-joint risk. Copyright © 2019 Brain-Pad Blog / Brain Pad Inc. All Rights Reserved. Blog Design by JungleX.